Most businesses realize the importance of having a marketing budget. After all, everyone knows that no one’s going to come banging down your door, regardless of how amazing your products and/or services are. However, when it comes down to the nitty, gritty details on strategy and implementation, too many businesses find themselves falling short.Are you one of the many business owners out there who simply just don’t know where to start when it comes to spending their marketing bucks? If so, realize that you’re not alone. The hard truth is that what you spend, how you spend it and where you spend it is largely going to depend on the intricacies of your business and industry. There is no one-size-fits-all solution and the process of honing down the most effective marketing efforts for your business is largely experimental in nature. It requires patience, constant analysis of analytics and re-working in order for you to find that ideal sweet spot for your company. But while there’s no one-size-fits-all solution, there are definitely guidelines based on industry standards that you can use to get yourself started on the path to the perfect marketing strategy for your company. The purpose of this article is to give you concrete advice on exactly where and how to utilize your marketing bucks. In addition, we’ll provide you with a few examples of noteworthy, cost-effective industry tools that have a high reputation for quality and performance. If you’re a business owner who’s fed up with vague, ambiguous information on how to market your business the right way, then this article is for you. Making sure you’re using the right tools for the job is absolutely essential when it comes to effective implementation of your marketing strategy. So many businesses find their marketing departments losing money as opposed to generating money as they’re supposed to many times due to the fact that they’re hemorrhaging money on tools they don’t need. Take for instance an example used by Neil Patel. The digital marketer discusses how he once encountered a client that was using a whopping 18 different subscription tools just for monitoring traffic and analyzing/improving their search engine rankings. Upon further assessment, he found that many of the tools they were using simply weren’t even right for their business. While this article will delve into detail on various marketing tools your business can use to succeed, it’s important to keep in mind not to get too gung-ho about things. Take your time with tool selection and sign up for free trials whenever you can so that you’re able to properly test the programs before diving head-first into a steep financial commitment. If the tool shows value, then keep it. If it doesn’t — nix it and move on to another. Is this tool saving you time or money (directly or indirectly)? Is this tool making you time or money (directly or indirectly)? If you answer “yes” to either of these questions, then you’ll do well to weigh the costs/benefits of using the tool and coming up with a definitive answer on whether you should continue with it. So if you’re wondering how to being your journey on finding the right tools for the job, you may want to start by isolating exactly which jobs to focus on in the first place. Email marketing is an absolute must when it comes to essential tactics for your digital marketing campaign. 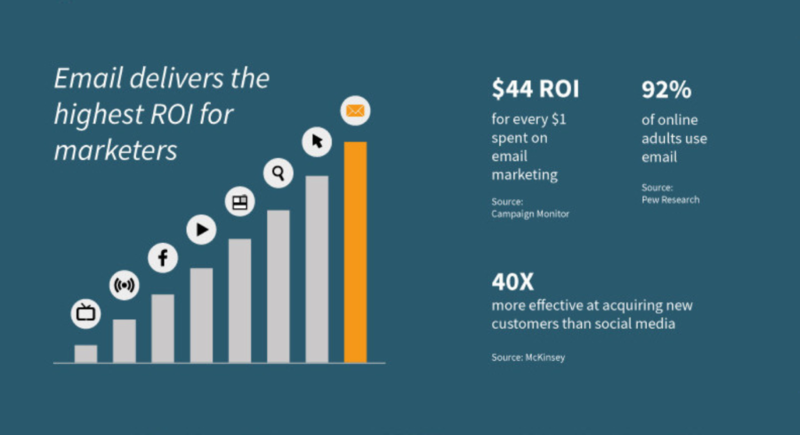 Email still has some of the highest ROI out there — $44.00 to be exact, for every $1.00 spent. This is largely due to the fact that the vast majority of individuals utilize email either for work or personal purposes. According to HDWebPros, businesses should seek to spend approximately 10% of their marketing budget on email marketing. However, don’t make it all for naught. Email marketing can be a tricky endeavor and it always helps to pull on an experience marketer or copywriter with marketing experience to help you create effective, personalized, click-worthy headlines and content for your email list. GetResponse is a popular tool in the industry that will start you out at around $15/month. MailChimp is another extremely popular tool used by many individuals and will cost you absolutely nothing for up to 2000 contacts. That’s right — the base plan is absolutely free. These are two of the most cost-effective options out there in comparison to other programs such as Constant Contact, which can run you $45/month for just 500 email contacts with their Plus program (aka the only option that offers automation). With these tools you can expect advanced segmentation options, auto-responders, tracking, pop-up forms, the convenience of automation and much more. But what about email capturing you ask? Many businesses may find themselves in a position where they’re still just trying to get as many sign ups as possible. If that’s the case, then you’ll love HelloBar — this awesome tool is a totally inconspicuous way to generate email leads without the annoyance of pop-ups. Just ask Neil Patel — when he threw it up on his QuickSprout website, this nifty little tool accounted for 11% of all of his leads. 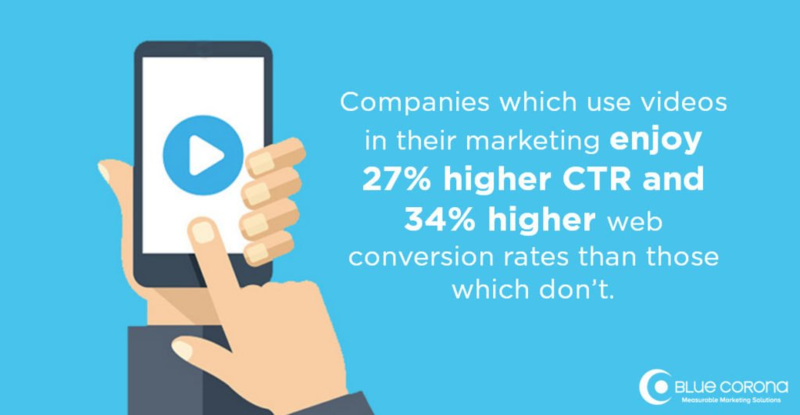 A whopping 80% of businesses are using video marketing in 2018. This number is up from 63% in 2017 alone. Furthermore, 76% of marketers surveyed said that video has helped their company increase sales. Video is huge. 81% of consumers said they purchased a product after viewing a video and since most people are visual learners by nature, one of the most powerful ways you can connect with your audience is through video. But the catch is, you have to make it count. 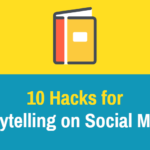 One-fifth of the individuals that view your video content will click away from a video within 10 seconds or less — so you have to reel them in right away. Use your video marketing to educate your consumers about your products or services or provide social proof by showcasing customer testimonials. The good news is you don’t have to splurge on products to get your message out there. Sometimes all you need is an iPhone camera and a few simple editing tools. It goes without saying that you can’t go wrong with Adobe Premier Pro, assuming you have the prior experience or drive to learn the ins and outs of this extremely robust and professional program. Splice is one of my personal favorites for those quick and easy videos to pop out to highlight products or company culture and is brought to us by the makers of GoPro. Animation is also pretty big now a days and there are plenty of tools and suites you can use to create awesome animated videos for your company. Builderall for example is an all-encompassing digital platform that businesses can use to generate complex sales funnels and includes services such as landing page creators, SEO tools, blog builders, and yes — even animated video creators. This is a great option for those looking to get a lot of bang for their buck, who also have the time and energy to learn the platform. 66% of marketers said improving SEO and growing their organic presence was their “top inbound marketing priority”. Content still reigns king and that includes everything from email copy to blogs, advertising and video. 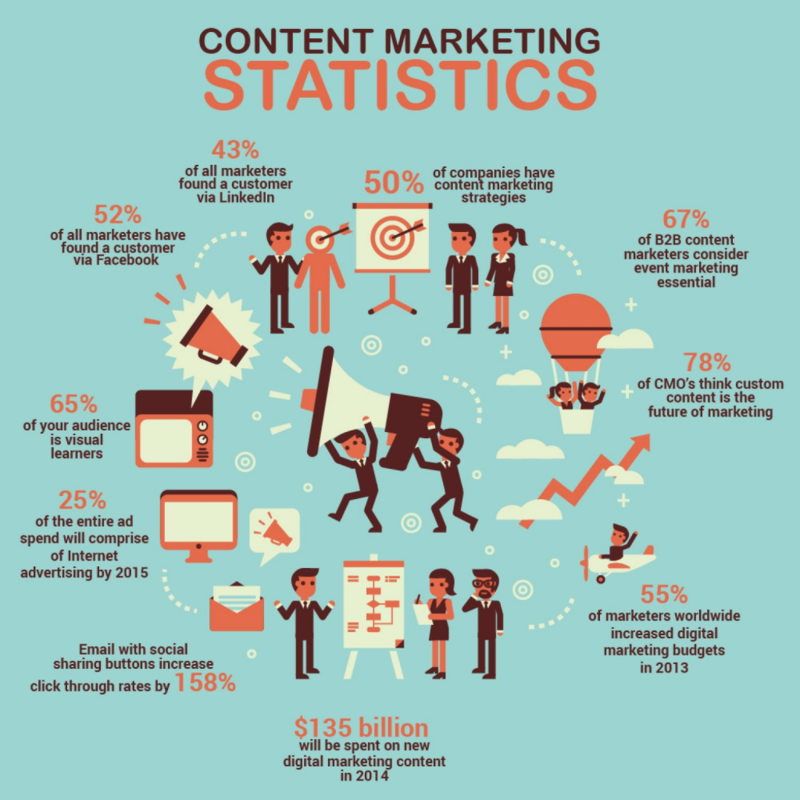 Content is everywhere and you should be spending a decent chunk of your marketing dollars (HDWebPros recommends 20% of your marketing budget, to be exact) ensuring that you have the best content you can afford. Whether you’re creating case studies, industry reports, a blog to help spread awareness and increase organic search rank or guest posting to help get your name and business out there, you can’t go wrong with content as long as you don’t skimp on quality. This includes ensuring that your content is search-engine optimized so that you can give yourself as much of an edge over your competition as possible. 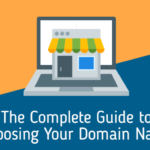 However, if you’re like many business owners out there, you may be a bit hazy on the specifics of SEO or simply just not have the time to be able to implement it properly. That’s okay. There are a ton of tools out there that can help you. Screaming Frog is a popular tool that can help with the technical details of SEO such as broken link finding, redirect auditing, duplicate content checking and XML sitemaps. If you’re a WordPress junkie, Yoast SEO is amazing and definitely a tool worth checking out if you don’t already have it. There’s no denying that Google Adwords can absolutely “…make or break your business” depending on how optimized your ad campaign is. Pay-per-click is still an important tactic not to forget when it comes to wisely spending your marketing dollars. Did you know that “when consumers are ready to purchase, 65% of them will click on a paid ad”? Even more interesting is that according to recent research from CleverClicks, “an average return of 2:1 is made by businesses using Google AdWords”. PPC works — point blank — and more than many would imagine. While SEO is always an important strategy to include when it comes to content marketing, research has also found that when consumers are directed to a site through a paid ad, they are 50% more likely to make a purchase than organic visitors.. When it comes down to it, branding is important. Every piece of content, every video, every post, page and image that comes through your company should put off the same persona. Your brand is how the public perceives you — it’s your reputation, and it should be managed and crafted carefully and strategically. Maybe you’re running into a situation where you’re not really exactly sure where your company’s brand stands? Maybe you haven’t put much thought or allocated many resources towards it up until this point. Rebranding is always an option if you’re looking to get on top of how the public perceives you and it should always be considered before any large marketing pushes or campaigns are implemented. So what are some ways that you can manage your brand? You can start with the visuals such as logo design and making sure your website design, copy, ads and materials all follow accordingly. Canva is an industry favorite that can be used for “designing presentations, social media graphics, email banners, flyers, and more.” Brandmark is also a cost-effective option for those looking for more affordable options to start with. 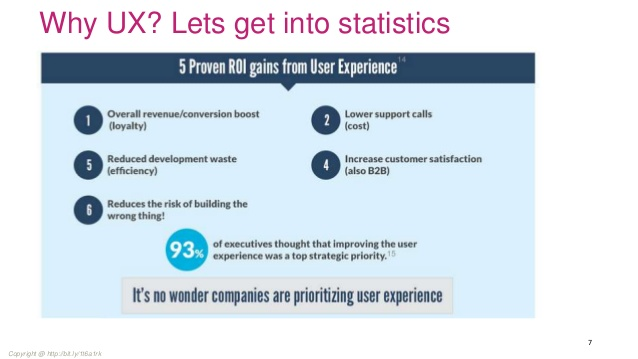 Did you know that 93% of executives cited improving the user experience as one of the top strategic priorities for their businesses? When you improve the user experience, you’re not only helping to boost your organic search rank (Google’s algorithms love user-friendliness), but you’re boosting both revenue and conversions as well as customer satisfaction and thus, loyalty. Ways to improve the user experience range from streamlining onboarding processes, improving upon customer service or even something as simple as ensuring that your website is properly optimized for mobile traffic. Lucky for you there are tons of options available to help test user experience with tools such as Optimizely, UserTesting and Usability Tools being pretty popular options. 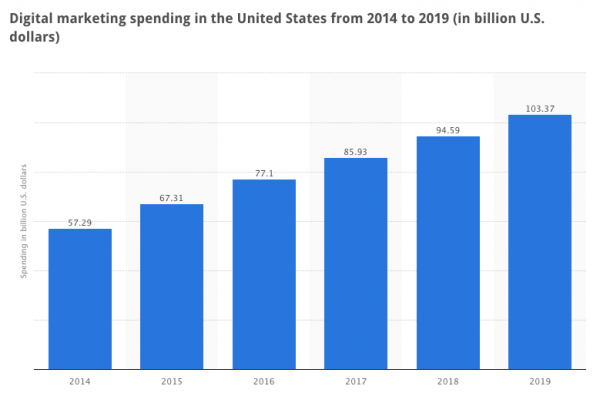 Many businesses know the importance of social media when it comes to marketing, however if you’re like most, you’re not exactly sure either how much money you should be spending on social media, or whether or not you’re spending it wisely in the first place. 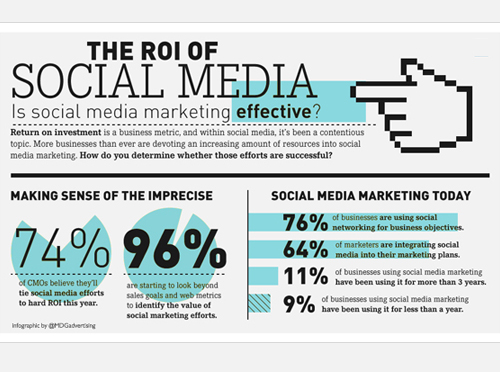 It’s been traditionally hard to tie social media marketing efforts to hard numbers when it comes to ROI, but as it’s become increasingly more popular among the business industry, more and more companies are finding effective ways to quantify their results. Video ads are becoming increasingly more popular and according to recent research by Social Media Today, having a whopping “135% organic reach on Facebook”. One of the most important benefits that you can get from harnessing a solid social media tool is the gift of automation. Buffer is probably one of the most important social media marketing tools out there and offers a robust amount of options for not just scheduling posts, but classifying them and even specifying certain patterns. It also offers analytics so that you’re able to evaluate how effective your efforts have been. 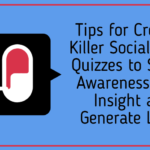 Other popular tools include Hootesuite, Sprout Social and BuzzSumo, which is absolutely king when it comes to finding popular and trending content for your social media campaigns. Last but not least, we’d like to throw in a little bonus tactic that all too often gets overlooked when it comes to marketing expenditures. Many businesses find themselves in a tough spot when it comes to PR. It almost seems like a dirty word. Images of boutique agencies offering egregiously overpriced services and ambiguous results often come to mind. However, if you’re like many businesses out there who struggle to afford adding a traditional PR agency into your marketing mix, fret not. There are a few tools that you can use to get killer results and one of them is absolutely free. HARO is one of those awesome little aces up your sleeve that can be a total game changer. HARO stands for “Help A Reporter Out” and it’s a free service where industry experts can sign up to receive daily emails from media contacts looking for quotes, sources and insights from relevant professionals. This awesome service not only can help you establish yourself and your business as significant players in your industry, but it can also be a great tool for link building. Quuu Promote is another awesome tool that every business could use in their arsenal for digital PR purposes. The company Quuu cleverly harnesses their database of users for their content curation tool and promotes your personalized content to them (for a fee, of course). So while it may not be free, it’s a quick and effective way to get your content out in front of a targeted audience of real people (not bots) that has specifically opted in to receive industry content such as yours. Figuring out exactly how your business is going to implement it’s marketing strategy and allocate valuable resources doesn’t have to be a major headache. After all, when it comes down to it, there simply isn’t any one-size-fits-all solution. There are, however, various tactics that are an absolute must when it comes to allocation of your marketing dollars and keeping this guideline in mind will ensure that you have a well-rounded, effective digital strategy regardless of your business’ size or industry. 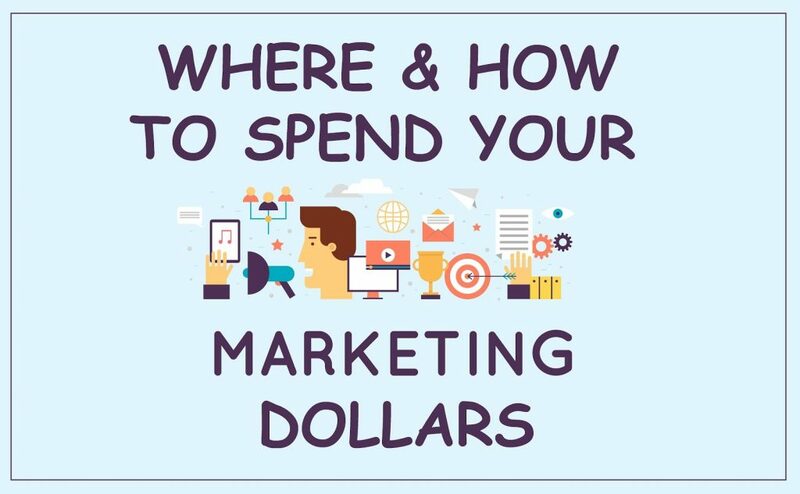 When it comes to spending marketing dollars, you absolutely can’t go wrong with these essential tactics. So get on the path to more effective implementation and obtaining bigger, better results from your marketing dollars today. Like the article? Feel like adding anything to the conversation? We’d love to hear your two cents! Leave us a comment below!